Home gyms from brands like Bowflex, Body-Solid, Total Gym, and Marcy are popular way to skyrocket overall fitness and feel great while targeting almost every muscle group for anything from muscle building to weight loss. And you can do this all in the comfort of your own home. On top of that, this happens to be a golden age of all-in-one machines coming in the full range of prices and features. Depending on your budget, you don’t have to break the bank to get your own amazing multi-functional home gym. And if you want to take it to the next level we’ll help you decide among the best home gyms in terms of quality and features. Working out at home is always a great way to ensure a consistent fitness routine. On top of that, with a home gym (versus a gym membership) you don’t have to wait your turn to get on a machine, you don’t have to wipe off some stranger’s sweat before you use it, you don’t have to worry about people watching or judging you, and you don’t have to pay a monthly membership fee. You can pack your bag and head to a crowded gym, or you can get all of the same exercises on a single piece of equipment in the comfort of your own home. With a home gym, you work out when you want and however you want. Depending on your fitness goals and budget, the perfect home gym for your needs is definitely out there. Whether it’s based on bodyweight, resistance bands, or good old fashioned weight plates, there are a lot of products on the market. Add to that, home gyms really vary quite a bit in terms of style, function, and quality. To help you on your quest, we’ve broken down our top choices below for best home gyms by price. Dual-function pec dec made to provide traditional flys and dumbbell style flys. Dual functioning, independent motion, chest press arm and vertical butterfly. Dual functioning leg developer for leg extension/leg curl exercises. High and low pulleys for upper and lower body exercises. There are a lot of home gym choices in the same price range as the Bowflex Blaze Home Gym, but the options on this machine are far superior and compete with home gyms priced well higher. For starters, this home gym can be upgraded to 310 or 410 lbs of resistance. You won’t find this much resistance on any other resistance-based home gym, unless you pay about double the price of the Blaze Home Gym. Bowflex also markets this home gym as providing more than 60 different exercises. Another design feature on the Bowflex Blaze Home Gym is that it has a sliding bench to perform rows. Again, this is not a standard feature in this price range. Finally, Bowflex provides a better warranty than you’ll find on other home gyms. At this price and with these options, we can’t find a better home. Click here for our full review of the Bowflex Blaze. With over 40 years of experience, Total Gym is a well known reputable manufacturer and they have designed a quality machine with the FORCE Home Gym. Where other bodyweight home gyms get a little wobble, the Total Gym FORCE Home Gym is solid as a rock. And with a 350 lb weight capacity, you’ll be hard pressed to find another home gym that can compete. The FORCE Home Gym is priced extremely competitively, but what pushes it over the top and the extras that Total Gym throws in. On top of the machine itself, you also get an AbCrunch attachment, wing attachments, leg pull, dip bars, press up bars, squat stand and a large stability mat. Total Gym also provides training material like the Intermediate Program DVD, Total Body Workout DVD and Total Gym Exercise Flip Chart. As a final bonus, you get a complete nutritional program and meal plan to help you meet your fitness goals. We dare you to find another home gym with this quality and sheer number of extras. Click here for our full review of the Total Gym Force. At this price, the Marcy Diamond Elite is almost impossible to beat. 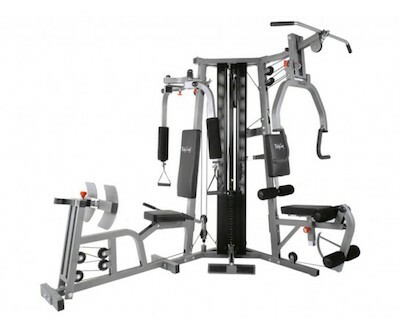 The all-in-one design gives you the flexibility of a pulley machine, Smith machine, and free weights. Among the huge amount of features that the Diamond Elite’s design offers are a free weight squat rack, a pec deck station, a press bar with sealed bearings, a separate Marcy Olympic weight bench, a dual-function leg developer, high cable crossover, a low pulley with a foot rest, and of course the Smith machine. The Smith machine’s safety stoppers and adjustable catches allow you to safely test yourself with heavy weights and not have to worry about a spotter (always keep safety in mind though!) And on top of all of these exercises, you can still use the included bench with dumbbells (not included) to isolate muscles. But with just the cage itself you’ll be able to hit just about every muscle group – and hit them hard. Overall, the Marcy Diamond Elite Smith Cage puts you in full control of your workout and sets you up to reach your elite body goals. Click here for our full review of the Marcy Diamond Elite Smith Cage System. The Body Solid EXM3000LPS Double Stack Home Gym comes with dual 210 lb weight stacks. So while this is a home gym, which usually means a solo workout, with this Body Solid machine you can have a partner to exercise with. Two people can exercise at the same time, each utilizing a separate weight stack. This machine also has seven different stations specifically designed to target various muscle groups. With these stations, you will undoubtedly hit ever muscle group in the upper and lower body and in back and abdominals. Multiple stations are great because they put you in the correct position and angle to target the muscles. The dual weight stacks and multiple positions means less wear and tear on your machine because the stacks and the stations share the work load. Not that it’d matter with the Body Solid lifetime warranty on this home gym. Click here for our full review of the Body-Solid EXM3000LPS Double Stack Home Gym. Deciding on the Right Home Gym: What Are Your Fitness Goals? In order to find your home gym, you really need to take a moment to consider your ultimate goal. Whether you’re a beginner or advanced exerciser isn’t important. You can always tailor your exercises and resistance/weight to fit your personal needs on a home gym. The most important question is, “Where do I want my body to be in X amount of time?” Here are the two main directions people usually head towards. As the muscle repairs itself, your muscles slowly get a little bit bigger. This is how you build muscle mass. Now, there are resistance-based home gyms that can build muscle, but they are definitely higher-end machines that provide a lot of resistance. You’ll have to compare your budget with what is commercially available. If your end game is burning calories, losing fat, or toning your body, you really can’t go wrong with any home gym. Resistance-based home gyms are probably geared a little more toward these goals, because the amount a weight that you are exercising with is generally a lot less than weight-based home gyms. Low weight and high repetition equal more calories burned, which in turn gets rid of fat and tones the body. But you can still use low weight on weight-based home gyms. So, if your initial goal is to lose some weight and tone, but eventually you’re going to want to add muscle, you’re better off going with a weight-based gym from the start. If you have no intention of ever building muscle mass, then a resistance-based home gym is probably better for you. There’s no doubt that the perfect home gym is out there for you. Ask yourself what it is that you want when you reach your ultimate goal. Home Gym Tech: Resistance or Weight Stacks? For this section of the review, we’ve broken the home gyms into two groups: resistance-based and weight-based home gyms. Here are some benefits and a discussion on how each of these home gym styles differ. The first style that we want to discuss is the resistance-based home gym. Resistance style home gyms are great for novice users and people with physical limitations. The smooth movement of a resistance system is very easy on joints. Your body won’t experience the same wear and tear that you would see with weight stack or weight plate home gyms. While this is an advantage, resistance style home gyms have their drawbacks too. The main drawback is that over time these rods and bands are going to lose their elasticity. It will be difficult to tell if you’re improving physically, or if your system is losing resistance. Eventually, you will need to upgrade and/or replace your rods or bands. This can be expensive, but it is a necessary cost of maintenance if you continue to utilize this gym. Another drawback to the resistance style is that it’s difficult to build muscle mass with these home gyms. Resistance style home gyms are great for maintaining an elevated heart rate, for burning calories and for toning. However, in order to build muscle mass, you generally need to be able to lift heavy weights to shock your muscles, even if it is for lower repetition. Doing this on a resistance style gym can be difficult. There are many different types of resistance-based home gyms to choose from, but we can make it easy by separating them into two groups: Bowflex and everybody else. Their high quality machines and innovative resistance systems make Bowflex well known in this field. Bowflex machines are designed in the same style as many weight stack gyms with a seated and/or horizontal bench that allows you to perform exercises for the entire body. Bowflex primarily uses rods as its resistance system, but higher end models will use resistance plates. Another well known name in this group is Total Gym. Total Gym is another quality manufacturer that utilizes an inclined bench, bodyweight, and bands as its resistance system. Most other lesser known resistance-based home gyms have similar designs, but the quality may not be up to the same standard. Bottom line is there are a lot of options and styles within the resistance-based home gym group. If this is the type of home gym that you’re in the market for, make sure you do your research and pick one that will work best for you. Weight-based home gyms use weight stacks and/or weight plates to add resistance. These are the machines that you see in commercial gyms. The main advantage of these home gyms is that they can take all of the wear, tear and abuse that you can dish out and more. As we said with resistance-based home gyms, over time the elasticity of the rods or bands are going to wear out. You’re going to have to replace the resistance system. You’ll never need to replace weight stacks or weight plates. Now, as you build muscle and get stronger, you may outgrow your weight stack or weight plates. So you may need to buy more, but what you already have will always be yours. That brings us to a drawback of weight-based home gyms. For weight stack home gyms, you’ll get a certain amount of weight with the machine. Once you’ve outgrown that weight, you’ll need to upgrade and buy more weight. Beware that some weight stacks do not provide a weight upgrade. What you get is what you get. For weight plate home gyms, you will normally not get any weights at all. You’ll need to buy whatever you need. However, as long as you stay within the capacity of the machine, you can add as much weight as your will ever need. As you can see from all of this buying, you may need to make a pretty large initial investment for your weight-based home gym. That is the ultimate drawback. These home gyms do tend to cost more money. That being said, these gyms are as solid as anything you’ll see in a commercial gym and will last you a lifetime. The reason everyone should want a home gym is that it is the best way to get a full body workout. You can buy a treadmill, an elliptical, or an exercise bike; they’re all great at raising your heart rate and burning calories. Much so better than a home gym, but they can’t get you a full body workout. Even entry-level, budget-friendly home gyms provide 30-40 different exercise options for the upper and lower body and for the abdominal area. Some home gyms advertise over 100 different exercise options. Even though treadmills, bikes and ellipticals may be the best at burning calories, with low weight/high repetition exercises on a home gym, you can still burn calories. On top of that you will be toning muscles throughout your entire body. What sets a home gym apart from other exercise equipment is that it builds muscle. The primary purpose of most other fitness machines is to improve cardiovascular fitness and burn calories. A home gym can do that, but it can also build strength and muscle. By performing these 30, 60 or 100 different exercises with heavy resistance, you slowly tear, repair and build your muscles. The more muscle you build, the more calories your body burns to move and exercise. By building muscle you are turning your body into a calorie burning engine. There is no machine that can build muscle like your own personal home gym. Which of these scenarios are you currently living with? You wake up at the crack of dawn to hit the gym. You rush home from work to eat quickly so you can get to the gym before it gets too crowded. You go straight to the gym after work and don’t get a chance to eat dinner until 8:00 at night. There’s no doubt that a home gym is a major benefit for anyone. Why in the world would you want to go to a commercial gym, if you don’t have to? That goes for a lot of exercise equipment, but with a home gym, it hits “home” even harder. Home gyms can provide you anywhere from 30 different exercises to over 100. These exercises can target every muscle group in your entire body. There is no exercise that you can do in a commercial gym that you can’t do on a home gym. Say goodbye to monthly gym membership fees. On top of all that, the best advantage of a home gym has got to be convenience. No more do you have to wake up early to beat the rush to the gym, or eat a late dinner so that you can go to the gym after work. You won’t miss another workout because you feel like you don’t have enough to drive across town and get your routine in. With a home gym, you work out on your own schedule. You won’t have to worry about someone else using the machine when you want it. The convenience of having your own home gym will greatly increase your opportunities to exercise. You don’t need to be Arnold Schwarzenegger or Lou Ferrigno to have your own home gym. It doesn’t matter if you’re a beginner or a fitness guru, home gyms are for every fitness level. Home gyms are a convenience for people who want a full body workout in their own home. More advanced users will probably want to focus on weight-based home gyms. These gyms are great for building muscle over the entire body with 50-60 different exercise options. The heavy weight allows you to shock your muscles into growing. Yet, they can still be used at low weight/high repetition for toning muscles. Resistance style home gyms are great for beginners because they provide tons of exercises with low weight. Compact home gyms are great for people looking to start a healthier lifestyle or to lose weight and tone up. Another reason novice users may have stayed away from home gyms is because they are perceived as costing a lot of money. However, these days inexpensive home gyms are easily found. There are good home gyms available that cost only a couple hundred dollars. There’s no reason anyone, at any fitness level, should shy away from purchasing their own home gym. When you think of a home gym, low impact may not be the first thing that comes to mind. But it is definitely a benefit. Low impact exercises are realized more with the resistance-based home gyms. The smooth resistance of the elastic rods and bands, or the use of bodyweight, is easy on the joints. Most physical therapists utilize resistance-based exercises in rehabbing patients. Utilizing resistance exercises allow your muscles to stretch and relax in a smooth, consistent manner. This prevents the shock and bounce at the end of the motion that causes muscle spasms. These same movements can be performed on home gyms to provide pain-free, calorie burning exercise routines. The only pain you’ll feel is the natural burn of a great workout. If you never thought you could afford a personal home gym, you’re wrong. For the cost of a couple months of a gym membership, you can have a gym in the convenience of your own home. Though you’ve heard it many times, with many other pieces of exercise equipment, with a home gym you can truly get rid of your gym membership. You can perform every exercise on a home gym that you can do in a commercial gym. No more do you have to deal with the crowds and wait for a machine to open up, or worry about what other people are thinking about you. Having a home gym will free up time that you never thought you had. It’s important to keep in mind that home gyms aren’t only for getting big muscles. You can get HUGE if you want, but contrary to popular belief, big muscles don’t even have to be a result. In fact you can use a home gym to create really any kind of body you want. Want to get smaller? Strength training can absolutely be a huge part of burning fat and dropping unwanted pounds. Want to get leaner? Lower the resistance and do higher reps to tone your muscles and feel great. Want to get bigger? Crank up the weight and pack on that muscle mass. Overall fitness? Create a fun combination workout. That’s the beauty of a home workout machine. You are dialing in your own fitness and the results are up to you. To find your home gym, you need to determine what your personal goal is. Do you want to build muscle? If so, a weight-based home gym is what you need. If you just want to get in a little better shape, or burn some calories and tone up, then maybe a resistance-based home gym will do the job for you. Whatever you decide, make sure it fits your end goal, because a home gym will last a lifetime and get you started on a brand new, healthier lifestyle. Will you be comparing the Bowflex HVT to the Nordictrack CST at any time? Hi Gus, Thanks for you question. It’s on our list of things to review!